Back in 2006 when we first published this article, the title was Make Your Own Solar Panels for $3 per Watt – a price which compared very favourably with the retail price of commercial photovoltaic solar panels of around £4-5 per Watt ($6-8) at that time. Anyone short on money but with time on their hands, could save a fortune by making their own solar panels. However, over the last few years the cost of commercial PV solar panels has plummetted to below $1 per Watt thanks to massive oversupply from hundreds of China’s government subsidised factories. (See our 2013 blog post for details: Are Prices of Solar Panels Going to Stop Falling or even Rise?.) This has made the economic case for making your own solar panels dubious, but making a solar panel remains a fun, challenging, and very educational project too. Solar panels whether commercially-made or DIY-made are constructed by wiring solar cells together in an array. 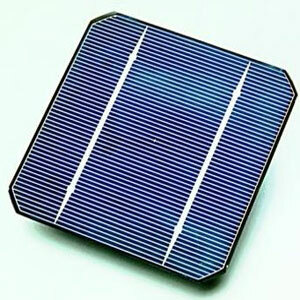 Pictured below is an example of such a single solar cell of which typically 36 would be connected in series to make a 12VDC charging solar panel. Back in 2006/2007 obtaining the solar cells to make solar panels was quite tricky. There were a few US manufacturers who sold off chipped and otherwise surplus solar cells at low prices, but solar cells are so fragile that getting them delivered to you in one piece proved troublesome and expensive. In this article we always recommended Silicon Solar kits which are supplied with a set of well packaged solar cells, detailed assembly (soldering and wiring) instructions, interconnection material (metal ribbon), a soldering iron, and liquid solder for easy soldering. To this day (January 2014) they continue to sell a complete 45 Watt solar panel kit for around $80 to the US market for example. Thankfully, since around 2010/2011, good solar panel kits have also been available in the UK – details later in this article. 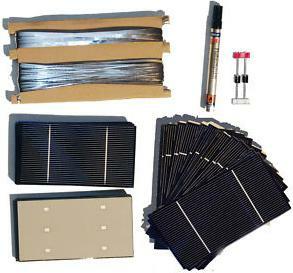 If you are interested in these DIY Solar Panel Kits click here. Though Silicon Solar Inc are based in the United States, they do offer worldwide shipping. Although it is possible to purchase the cells and other components independently, when the costs of postage etc are included, it makes more sense to just buy one of the new cheap solar cell kits which are available from sellers here in the UK. Pictured above is a solar cell kit made up of 72 3″x6″ 1.8W 3.6A 0.5V ‘B’ grade (cosmetically faulty but perfectly functional) solar cells. They could be connected in two parallel connected strings of 36 to make one large 80W+ panel or made into two separate 40W+ panels for 12V charging. The kit includes wire, busbar, a rosin flux pen, and a couple of diodes, so all you need to a soldering iron. Priced at around £60 (£20 less than it was in 2011) including delivery from Germany. Click here for more information and/or to purchase this Solar Cell Panel Making Kit and others like it (smaller kits and kits for making up to 1kW of panels).